When it comes to arming autocrats in Africa, upstart China is no match for the United States, a study of arms exports finds. China's sales of weapons to dictatorial regimes such as Sudan and Zimbabwe have sparked outrage from human rights advocates, academics and officials in the West. Some say that Beijing is undermining the development of democracy and rights in Africa. In a State Department cable recently released by WikiLeaks, the top US diplomat for Africa, Johnnie Carson, summed up the basic sentiment for an audience of oil executives in Lagos, Nigeria, in February last year when he noted: "China is a very aggressive and pernicious economic competitor with no morals." But compared with the US, China actually shows a preference for relatively democratic clients such as Zambia and Namibia, according to a review of arms transfers from the end of the cold war until 2006. And morals or not, the US tends to favour autocrats and human rights abusers - most notably its ally Egypt. "The US is promoting its strategic interests even if it means promoting authoritarian regimes, while China is more interested in economic relationships," said Paul Midford, who co-authored the study with Indra de Soysa using data compiled by the Stockholm International Peace Research Institute. The findings turned common wisdom on its head, said Barry Sautman, a political scientist at Hong Kong University of Science and Technology. "People naturally assume that because China is an authoritarian state, it will want to sell arms to other authoritarian states, and that the US will do the opposite," Sautman said. The actual record is more complicated. In Sudan, a state with an egregious record of atrocities against its people, China has indeed supplied weaponry. But it is not the most important supplier of arms, the authors note. From 2001 to 2008, as international attention to China's involvement in Sudan grew, Russia sold five times more arms to Khartoum, according to the Stockholm data. More of China's arms went to Egypt - its biggest market in Africa. But there, Beijing's sales were dwarfed by the US. From 1989 to 2006, the US provided Egypt with billions of dollars worth of fighter jets, tanks, missiles and other arms. Hosni Mubarak, Egypt's president, has ruled since 1981 under "emergency" law that allows the government to detain people without charge. Torture by police and security forces is routine. "This is not to excuse Chinese arms sales to undemocratic or human rights-violating regimes," says Ian Taylor, a professor of international relations at the University of St Andrews who has written about China's role in Africa. "But we need to remember that firstly, China is not the worst culprit in this - the United States is, by far." The Stockholm data includes sales of things like tanks, military helicopters, and fighter aircraft. But it doesn't include small arms and dual-use equipment, which are often sold through brokers rather than by direct government-to-government arrangements. This omission was significant, said Deborah Brautigam, an expert in China-Africa relations at American University in Washington DC. Small arms, including AK-47s and ammunition, comprised the bulk of Chinese weaponry sold in places like Zimbabwe. And the trend, she added, may be towards more Chinese arms sales across Africa - not fewer. The authors might have come up with different results, she suggested, by looking at a shorter and more recent time span. 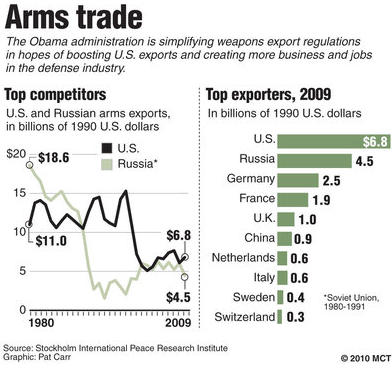 "China's export of arms, like all its other exports, are likely on a sharp rise year by year," Brautigam said. But Chinese arms sales did not signify an effort to challenge values like rights and democracy, Brautigam and other specialists said. To those who had painted a picture of an emergent superpower that sought to create a "Beijing consensus" of authoritarian states, the data from Stockholm illustrated that "there may not be anything to that", Sautman said. Midford and de Soysa are both political science professors at the Norwegian University of Science and Technology. Their research was initially presented at an international studies conference in New Orleans in February, and is under review for publication in an academic journal. Hi Paul, good to hear from you. I have read the study, although I missed hearing you present it at ISA. I'll send you a few more comments directly & correct the reference to it being a Swedish study (the study was posted on a Swedish website, sorry for the confusion). In the light of the newsalerts that I receive regulary (see some links attached) I’m not so sure of to what degree the figures in this study are new or even give a good overview. Most of the alerts put China in pole position and the trend goes certainly in this direction. Anyway, it’s a rather shaky evidence on which to claim that the findings turned common wisdom on its head, as Barry Sautman does, or to attribute to Beijing some moral high ground in this matter…. I think it will be a while before China catches up to the US, which is still in pole position worldwide (but not in sub-Saharan Africa). The Jamestown study you linked to above says that "...while China exported $7.8 billion worth of arms globally between 2000 and 2007, the United States exported over $92 billion worth; Russia was second with $36.2 billion worth of arms exports, and the United Kingdom third with nearly $34 billion worth." With the conclusion of the United States' $60 billion arms package for Saudi Arabia -- as of September 2010 -- the US will likely be comfortably in the lead for selling arms to wealthy dictators for some time to come. China will rapidly pick up any slack for the not-so-rich dictators (e.g. Africa), but there the competition will be stiff from Eastern Europe. This is an interesting conversation, and I think it deserves some further qualifiers. Firstly SIPRI data uses a special means to measure value - it is not based on monetary value but a means of measuring 'impact' of weapons systems - this means more sophisticated weaponry (ala US to Saudi Arabia) gets a higher value. China generally sends (even in comparison to Russia) low value weapons. Two: the leaving out of SALW is very important. These are the weapons that proliferate into non state actor hands and these are the weapons that drive much of Africa's insecurity. China has year on year increased its exports of SALW. e.g. 70% of Sudan's SALW from China. (p.s. for oil-weapons deals in addition to NORINCO in Zimbabwe you should read Ian Taylor's Chapter on Chinese arms - references CNPC-Sudan). Three: organisations like SIPRI seem sometimes to measure Chinese transfers and sometimes not to. Why? because the figures are notoriously unreliable and non-transparent. China as an exporter and African states as importers are bad reporters. ANY analysis of quantity needs to be taken with big bowl of salt. Four: Perhaps for this reason, others find different findings: The Congressional research service latest report suggests China is now Sub-Saharan Africa's biggest supplier. I think that the figures have changed since 2006, so I think the new report should be taken with some caution. Africa is seen as massive market for Chinese industry and has in fact been aggressively looking to increase sales since 2006. Five: However we should not focus on quantity but context: where arms end up and how they end up being used. US and EU have laws that specifically look at this. China does not really and its arms turn up in DRC or Darfur. However at the end of day a weapon is a weapons and west in Cold War was pretty culpable for Africa's current proliferation on a scale still felt today. Tom, these are very helpful and thoughtful comments (I'll clean up the multiple postings). Clearly the global norms on arms transfers are evolving and that's a good thing, even if implementation and mechanisms of norm enforcement lag far behind. Your comments on the Chinese and African data are spot on. I think the researchers at SIPRI -- ditto so many other places that try to do global data collection -- also don't have the time, contacts, budget, or sheer determination to really track down the details of the stories they see in the media. I've read Ian Taylor's work on Chinese military engagement & arms transfers in Africa & I think it's the best stuff out there. As this is not (at all) my area of expertise or interest, I always refer people to Ian's excellent work. Very interesting article. Any chance of a 中文 version? Guan, you could check with the South China Morning Post which was the original source of this publication. I'd be surprised if it hasn't been translated into 中文 by someone by now! Something that seems missing here is the impact of the weapons sales. If the US sold 100 jet fighters to Egypt that were just kept in military bases or taken on test flights, but China (state OR non-state actors) sold 1,000 AK-47 rifles that got into the hands of children and were used for killing, it's obvious which sale is the more disruptive. It is also slightly disconcerting that the point about the study not including small weapons was only mentioned 3/4 of the way through the piece. And that we were not given any comparative data with which we could have evaluated how many small weapons vs. big weapons sales happen (i.e., what if the number of small weapons sales is way more than the big ones that are referred to here, and China is leading the way? We don’t know that, the article doesn’t say, but it’s a really big question, isn’t it?). Also, it seems no attempt was made to figure out the impact of the various sales. That leaves one with an incomplete picture of what's happening here, and the _meaning_ of the news gets lost. The meaning should be something along the lines of, which kinds of arms sales, in which quantities, and by whom to who, are the most destructive of life and social order. The article does not address that, yet it's the most important thing going on. Journalism, of course, is different from scholarship in that it is limited in the points it can make. But the fact that the author made the points she did while leaving all these highly salient issues unexplored seems strange to me. Good points, Matthew. In fact, as I told the authors of the original study, there is data on small arms sales by China through the UN Comtrade database. Not sure how good the coverage is with regard to China and/or various countries in Africa, but it is a resource that should be consulted in a study like this.